This article is about the American Latin rock band. It is not to be confused with American rapper Juelz Santana. Santana is an American rock band formed in San Francisco, California in 1966 by Mexican-American guitarist Carlos Santana. The band came to public attention with their performance of "Soul Sacrifice" at Woodstock in 1969. This exposure helped propel their first album, also named Santana, into a hit, followed in the next two years by Abraxas and Santana III. Lineup changes were common. Carlos Santana's increasing involvement with guru Sri Chinmoy took the band into more esoteric music, though it never lost its Latin influence. In 1998, the band Santana was inducted into the Rock and Roll Hall of Fame with Carlos Santana, José "Chepito" Areas, David Brown, Gregg Rolie, Mike Carabello, and Michael Shrieve. The band has earned nine Grammy Awards and three Latin Grammy Awards, the latter all in 2000. Carlos Santana won a Grammy Award as a solo artist in 1988. The band has sold more than 100 million records worldwide, making them one of the world's best-selling groups of all time. In 2013, Santana announced a reunion of the classic line-up for a new album, Santana IV, which was released in April 2016. The band is tied with Michael Jackson for the record number of Grammy Awards won in one night. The band was formed in 1966 in San Francisco as the Santana Blues Band with the help of guitarist Tom Fraser. The first established members were Carlos Santana (lead guitar), Marcus Malone (percussion), Rod Harper (drums), Gus Rodriguez (bass guitar) and Gregg Rolie (lead vocals, Hammond organ B3). The group's first audition with this line up was at the Avalon Ballroom in the late summer of 1967. After the audition, Chet Helms (the promoter of the event), in concert with the Family Dog, told the band that they would never make it in the San Francisco Music Scene playing Latin fusion and suggested Carlos keep his day job washing dishes at Tick Tock's Drive-In on 3rd Street. By the time Santana began work on its debut album Santana, Malone had already left the band as he had been convicted of manslaughter and had started serving his sentence in Marin County's San Quentin State Prison. Ahead of Woodstock, Bill Graham was asked to help with logistics and planning. Graham agreed to lend his help only if a new band he was championing, an unknown band called Santana, was added to the bill. Santana was announced as one of the performers at the Woodstock Festival. The band started recording their 1969 debut album Santana in May 1969 and finished it in a month. Santana performed at the festival. Later that month, they released their debut album, which peaked at number 4 on the US Billboard 200 pop chart with the single "Evil Ways" being a top 10 single in the US. Santana went on tour to promote their debut LP and started work on their next, Abraxas. Work began in mid-April 1970 at Wally Heider Studios in San Francisco and was completed in early May 1970. The album, highlighted by a reworking of Fleetwood Mac's "Black Magic Woman" (written by Fleetwood Mac founder Peter Green) that peaked at number 4 on the US Billboard Hot 100, was released in September 1970 and rose to number 1 on the US Billboard 200. From January to July 1971 Santana worked on Santana III. Released in September 1971, the album also reached number 1 on the US Billboard 200. At the peak of the band's popularity, the album was the last to feature its classic Woodstock era line-up. Before recording their fourth album Caravanserai, there had been multiple line-up changes. Bassist David Brown left in 1971 before recording started and was replaced by Doug Rauch and Tom Rutley. Percussionist Michael Carabello left Santana and was replaced with two percussionists, Armando Peraza and Mingo Lewis. Keyboardist/vocalist Gregg Rolie was replaced by Tom Coster on a few songs. Caravanserai debuted at number 8 on the pop charts, despite not spawning a hit single. 13 months after Caravanserai, Santana released Welcome. Welcome was the first of four consecutive albums to achieve gold certification, as opposed to the previous four, which all at least reached platinum status. The album peaked at number 25 on the Billboard 200, the lowest of the band's career so far. The next few albums contained a more experimental style than their previous work, beginning with Borboletta, which fared arguably worse than its predecessor, despite climbing five spots on the US charts. The group's 1976 release, Amigos, was far more successful. Reaching number 10 on the US charts, and also hitting the top 10 in France, Australia, New Zealand, Austria and the Netherlands, it was a return to the success of their early albums. Festival, somewhat contradicted that new-found success, but was a short blip before another successful album, Moonflower, released in 1977. 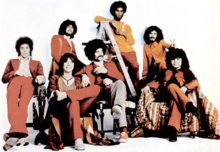 The album was possibly the most successful since Santana III, achieving 2x platinum in the US, and being the first album since 1974's Borboletta, to break the top 10 in the UK. It was characterized by a stylistic shift for the band, as it contained heavier influences from the more conventional sound of the group's early work, while still maintaining the experimental sound of their last few albums. Their next two releases, Inner Secrets and Marathon, released in 1978 and '79, respectively, were a further musical shift for the band, moving away from the Latin-fused rock music that had characterized their work in the late 1960s and the majority of the '70s, to move towards a more album-oriented, conventional rock sound. These albums, however, fared poorly commercially, although both achieved gold status in the US. The 1980s started relatively brightly for Santana, with 1981's platinum-selling Zebop!, which also reached the top 20 in several countries, and continued the more conventional rock sound. The following year, Shangó was released; this album marked a steep decline in the band's commercial fortunes, although it still achieved gold status. The group waited another three years to release the follow-up, the longest break for them so far. 1985's Beyond Appearances was a commercial failure, and their first album not to achieve gold certification. Their following three releases all continued this commercial decline, with the last of these failing to break the Billboard top 100. In the midst of this commercial pitfall, the band stopped recording material for an unprecedented seven years but continued to tour. In 1998, Santana was inducted into the Rock and Roll Hall of Fame. The following year, their album Supernatural (1999) debuted at number 19 on the Billboard 200 and reached No. 1 after eighteen weeks. Also reaching No. 1 were two singles: "Smooth", recorded with Rob Thomas, and "Maria Maria". The album was certified platinum 15 times by the RIAA and sold 30 million copies worldwide. Santana's previous number one album had been Santana III in 1971. According to Guinness World Records, this is the longest gap between number one albums. Supernatural won nine Grammy Awards, including the award for Album of the Year, and also won three Latin Grammy Awards, including Record of the Year. The follow-up to Supernatural came three years later and was highly anticipated by international media and fans alike. On October 22, 2002, Shaman was released worldwide. Although it initially sold briskly (298,973 copies in the US in its first week) and debuted at number 1 on the Billboard 200, the album's appeal quickly wore off and it soon slid down the charts. Despite this, it went on to sell 2x platinum in the US, and achieved platinum status in several other countries including Australia. The first single released from the album, "The Game of Love", which featured vocals from Michelle Branch, debuted at number 5 on the Hot 100. The album's next four singles failed to chart in most countries, but the final single, "Why Don't You & I", featuring the vocals of Alex Band, reached number 8 on the Hot 100. Musically, the album was a return to a more conventional sound for the group, with a mainly Latin rock-based sound. With their renewed appeal worn off, another three-year wait saw the release of 2005's All That I Am. The album debuted at number 2 on the Billboard 200 but fared worse internationally, and quickly lost appeal. The album, a continuation of the Latin-rock influenced sound of Shaman, achieved gold certification in the US. A five-year break from recording saw the release of another studio album, 2010's Guitar Heaven. Musically it was a drastic change for the band, with a far heavier sound at its core and strong heavy metal influences. It debuted at number 5 on the Billboard 200 but marked another decline for the band, failing to achieve gold status. In 2012 the group released Shape Shifter, which returned to the conventional Latin rock sound and was completely album-oriented, as no singles were released from it. It debuted at number 16 on the Billboard 200. On 2 February 2013, Carlos Santana confirmed that he would reunite his classic line-up, most of whom played Woodstock with him in 1969. Santana stated that he is reuniting the group with the intention of recording new music. Confirmed for the reunion are Neal Schon, who was in the band in the early 1970s where he traded lead guitar work with Santana before leaving with founding Santana singer-organist Gregg Rolie in 1973 to form Journey; drummer Mike Shrieve and percussionist Mike Carabello. Santana said of Rolie, who played with Ringo Starr's All-Starr Band for the last two years, "I'm pretty sure Gregg's going to do it." In February 2013, Rolie told Radio.com, "it's (the reunion) just a matter of putting it together and going and doing it. I would do it. I think it's a great idea. People would love it. It could be great!" In the meantime, Santana released on 6 May 2014 a new studio album entitled Corazón and on 9 September 2014, Corazón – Live from Mexico: Live It to Believe It, a new live album (on CD, DVD and Blu-ray) of their show in 14 December 2013 in Guadalajara, Mexico. On 15 April 2016, Santana released Santana IV, the wildly anticipated studio album that reunites the early 1970s classic lineup of Carlos Santana (guitar, vocals), Gregg Rolie (keyboards, lead vocals), Neal Schon (guitar, vocals), Michael Carabello (percussion) and Michael Shrieve (drums). The album marks the first time in 45 years – since 1971's multi-platinum classic Santana III – that the quintet has recorded together. The origins for the reunion go back several years, when Schon suggested that he and Carlos Santana record together. Santana liked the idea but went one better, proposing that they recruit Rolie, Shrieve and Carabello for what would be called "Santana IV". After initial writing sessions and rehearsals took place in 2013, the group recorded throughout 2014 and 2015, amassing 16 new tracks that combined all their signature elements – Afro-Latin rhythms, soaring vocals, electrifying blues-psychedelic guitar solos, and irrepressible jubilant percussion work. About the "Santana IV" team, Santana stated: "It was magical, we didn't have to try to force the vibe – it was immense. From there, we then needed to come up with a balance of songs and jams that people would immediately identify as Santana." Santana IV features 16 all-new tracks written and produced by the band. Joining the core "Santana IV" band in the studio are current Santana members Karl Perazzo (percussion) and Benny Rietveld (bass), with vocalist Ronald Isley guesting on two cuts. The first single from Santana IV, entitled "Anywhere You Want to Go", was released on 5 February 2016. On 21 October 2016, Santana released Santana IV: Live at the House of Blues Las Vegas on Eagle Rock Entertainment, a new (151 minutes) live album (on DVD/Blu-ray/2CD) of their concert on 21 March 2016 at the House of Blues, Las Vegas, Nevada. In early January 2019, Santana signed with Concord Records and on 25 January, they released In Search of Mona Lisa, a new (5-track) EP. The day before, they also released a video for new single, "Do You Remember Me." In March 2019, the band announced plans to release on June 7, 2019, Africa Speaks, their new full-length album produced by Rick Rubin. 2019 marks the 20th anniversary of Carlos Santana's iconic album, Supernatural, and the 50th anniversary of his legendary performance at Woodstock. Santana is currently headlining a multi-year residency at House of Blues at Mandalay Bay Resort and Casino in Las Vegas. The band is set to headline at both Woodstock 50 and Bethel Woods' half-centennial celebration in Bethel, NY, in August 2019. Prior and before, the band is touring in support of the new album, from April to November 2019. ^ "Pop/Rock » Rock & Roll/Roots » Latin Rock". AllMusic. All Media Network. Retrieved October 28, 2016. ^ Mojo (2007). Irvin, Jim, ed. The Mojo Collection: The Ultimate Music Companion (4th ed.). Canongate Books. p. 213. ISBN 978-1-8419-5973-3. ^ Strong, Martin Charles; Griffin, Brendon (2008). Lights, camera, sound tracks. Canongate. p. 525. ISBN 978-1-84767-003-8. ^ Fletcher, Amy L. (2012). "Acid Rock". In Debolt, Abbe A.; Baugess, James S. The Guide to United States Popular Culture. 1: A–M. Popular Press. pp. 7–8. ISBN 978-0-313-32944-9. ^ Pacini Hernández, Deborah (Spring 2000). "A Tale of Two Cities: A Comparative Analysis of Los Angeles Chicano and Nuyorican Engagement with Rock and Roll". Centro Journal. 11 (2): 79. ^ Steven Joseph Loza (1999). Tito Puente and the Making of Latin Music. University of Illinois Press. p. 16. ISBN 9780252067785. ^ Louise Chipley Slavicek (2006). Carlos Santana. Infobase Publishing. p. 77. ISBN 9781438106724. ^ "Santana". Rock and Roll Hall of Fame. Retrieved 16 April 2013. ^ Szaroleta, Tom (October 19, 2017). "Echoes of Woodstock: Santana one of the few big names still on the road". The Florida Times-Union. Retrieved October 19, 2017. ^ "Adele To Michael Jackson: Who's Won The Most GRAMMYs In A Night?". The Recording Academy. Retrieved February 8, 2019. ^ "Billboard". Books.google.co.uk. 1970-06-27. Retrieved 2015-08-24. ^ Smith, Steve (19 February 2013). "Santana Reuniting classic 60's and 70's lineup". Press Telegram. Archived from the original on 11 April 2013. Retrieved 20 March 2013. ^ "Santana – Corazon – Live From Mexico: Live It To Believe It DVD". Santana.hifi247.com. 2014. Retrieved 25 October 2014. ^ "From Team Santana: April 15th, 2016 marks the release date of Santana IV..." Facebook. 25 January 2016. Retrieved 10 February 2016. ^ "Santana IV CD". santana.com. 2016. Retrieved 10 February 2016. ^ "Listen to Santana – 'Anywhere You Want To Go'". news.iheart.com. 1 February 2016. Retrieved 10 February 2016. ^ "Legendary Musician Carlos Santana Signs with Concord Records". Concord Music. April 2019. Retrieved 9 April 2019. ^ Erlewine, Stephen. "Santana – In Search of Mona Lisa: Review". AllMusic. Retrieved 9 April 2019. ^ News, Jackson Maxwell 2019-01-24T21:52:26Z. "Santana Premiere "Do You Remember Me" Music Video". guitarworld. Retrieved 2019-01-25. ^ Kreps, Daniel (2019-03-18). "Hear Santana's Fiery New Rick Rubin-Produced Song 'Los Invisibles'". Rolling Stone. Retrieved 2019-04-09. ^ "Woodstock 50 • Aug. 16, 17 & 18 2019 | Watkins Glen, NY". Woodstock 50. Retrieved 2019-04-09. ^ Kreps, Daniel; Kreps, Daniel (2019-02-20). "Ringo Starr, Santana Lead Bethel Woods' 50th Anniversary of Woodstock Celebration". Rolling Stone. Retrieved 2019-04-09. ^ "Santana Fan Club Tickets". tour.santana.com. Retrieved 2019-04-09.